If you have expensive tastes, and you are also a little careless with dirt and spills, it can be difficult to keep a nice rug clean. Even if your carpet or rug did not cost a lot, it still pays to learn how to clean it properly. Of course, if you are strapped for time, or just want someone else to do the job for you, hiring a carpet cleaning company can be the best option. Cleaning a small rug by yourself is not too difficult, and it helps to be able to move the rug to a garage, utility room, or any open area. Doing this outside, on a clean surface, might be a good idea, as you will be using plenty of water. Be careful not to put the rug down on anything but a clean floor, or you will only make it dirtier. Vacuum your carpet on each side, thoroughly. If your vacuum cleaner is not working properly, or you have not emptied the bag, it will be difficult to get rid of surface dirt. Never attempt to clean your rug or carpet until you have first vacuumed. Find a quality shampoo, but choose something that is intended for this purpose. Harsh chemicals that are found in many detergents, or products that contain ammonia, can damage your rug. Before you begin cleaning, test your cleaning method on a small area of the rug, to ensure that the color will not run. Take a soft brush, with long hairs, or a sponge that does not shed its fibers. Be sure to wet the nap of the rug thoroughly with your soapy water. Using the same soapy solution, wash down the fringes of the rug. Using a brush, clean away from the pile, repeating with a brushing motion until it is clean. Do not be too rough. 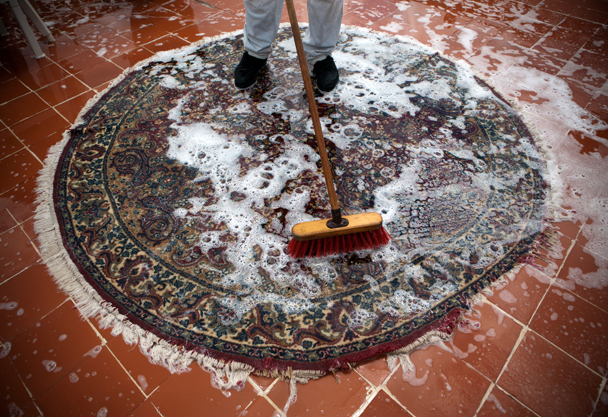 Once you are happy with your cleaning job, use free-flowing water to thoroughly rinse your entire rug. This is where it really helps to be in an area with drainage, or outdoors. 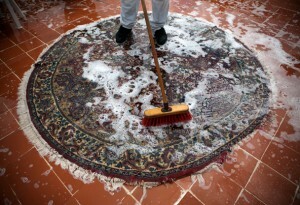 Now that you have rinsed the rug, squeeze away any excess liquid, and use a window cleaning squeegee if you have one. Squeeze away the water, following the nap’s direction, under you cannot bring any more water out of the rub. Now it is time to lay your rug down on, face up, on flat surface, and leave it to dry. Be sure not to leave it where dust or debris can float onto it. Once the top feels dry, turn the rug around and allow the underside to dry as well. The whole cleaning process might have made the rug feel somewhat stiff. Use a brush on it, or give the rug a light vacuuming. If the above steps seem like too much work, or you just do not trust yourself with cleaning a delicate rug, consider calling a professional service. There are plenty of qualified steam carpet cleaning services to choose from.